West Midlands Ambulance Service NHS Trust is now taking delivery of 40 Citroen Berlingo Multispace Forte 92hp 1.6HDi MPVs, over half of which have been specially converted for wheelchair accessibility. 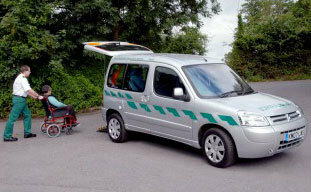 These new Citroens are being acquired to renew the Service’s entire fleet of small patient transfer vehicles. Oughtred and Harrison, Goole, is converting 24 of West Midlands Ambulance Service’s new Berlingo Multispaces for wheelchair accessibility. These converted models can carry a driver, up to three conventionally seated passengers and, via an integral ramp, a passenger seated in a wheelchair. The conversion involves replacing the original rear seat with two separate seats, which allows the wheelchair and its passenger to be positioned and secured centrally. The remaining 16 Berlingo Multispaces will be operated as conventional driver and up-to-four-passenger carrying vehicles. All West Midlands Ambulance Service NHS Trust’s new Berlingo Multispaces have been supplied by Citroen dealer, Murley Citroen, Leamington Spa. Operated on Appleyard, with maintenance, contract hire agreements, they will have a three year, 90,000 mile service life. The attractively liveried, metallic silver Berlingo Multispaces will be seen at hospitals in Coventry, Warwickshire, Birmingham and Hereford transporting a range of patients.